OK, we all know New Horizons zoomed past Pluto, took some breathtaking pictures and then called back home to tell us everything’s fine. But let’s switch our attention a bit and focus on Charon – Pluto’s Moon that’s just as mysterious as its name implies. Charon is the largest of the five known moons of the dwarf planet Pluto, at about 11% of the mass of Pluto. It was named after the ferryman in Greek mythology who would take people’s souls to Hades. Now, as NASA is receiving more and more data taken by the New Horizons, we’re getting the chance to look at more and more detailed pictures of Charon; one of them in particular has sparked researchers’ interest. The latest sliver shows a 200-mile-long portion of Charon that shows some striking geological features: specifically, we see a deep depression with a high mountain rising out of it. It’s like a geological castle. 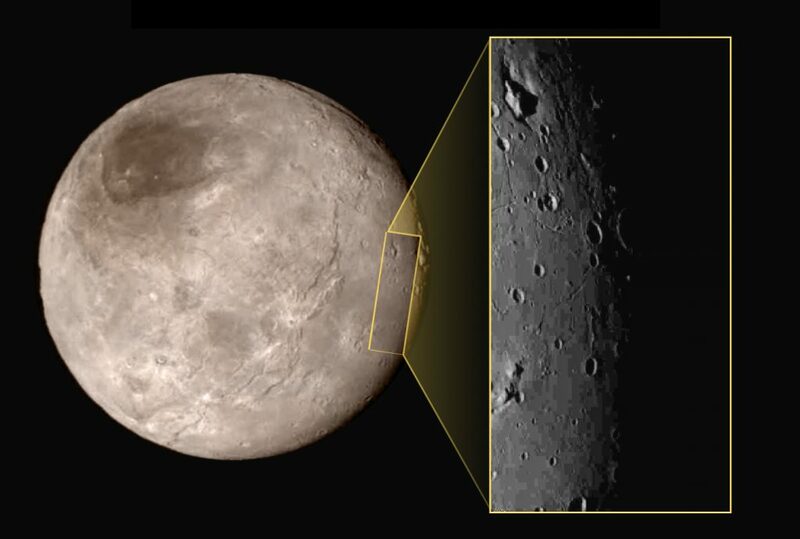 Charon is also pummeled with impact craters, something which can’t be said about Pluto. Actually, let’s go back to Pluto for a second. The presence of mountains on the dwarf planet, along with the absence of impact craters seems to suggests active uplift phenomenon, which is extremely interesting, because there’s no apparent mechanism driving it. Oh, and whatever may drive it, Charon doesn’t have it, so the mystery deepens. But this doesn’t mean that Charon isn’t active geologically. A previous image has already revealed a large smooth region in Charon’s southern hemisphere suggesting the contrary. NASA plans to release even more high-resolution images of Charon’s surface in the coming days.